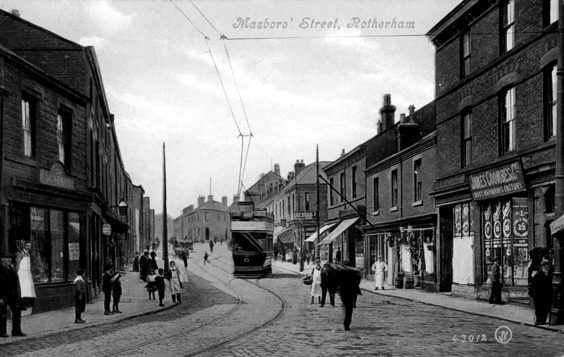 The Rotherham area has undergone profound change in the last century or so. There has been much demolition and rebuilding in the town centre, the town has grown outwards in all directions and the surrounding settlements – rural and industrial – have been transformed in many cases. Many working patterns and workplaces have disappeared, means of transport have changed beyond all recognition and even how people used their leisure time in the early twentieth century shows some striking differences from today. 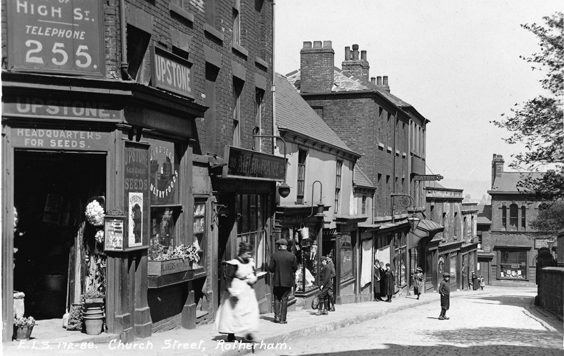 Church Street is shown as it was before all the buildings were demolished, rebuilt and demolished again to make way for the Minster Gardens. The shop on the extreme left announces over the doorway that it is the ‘HEADQUARTERS FOR SEEDS’. 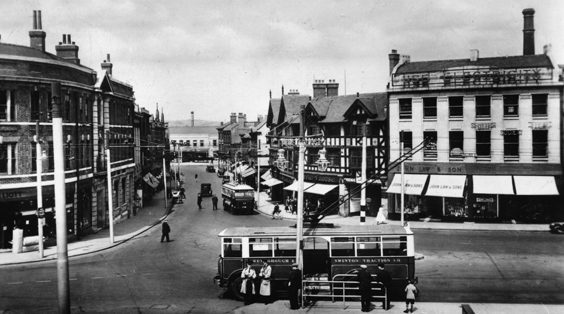 College Square, now renamed All Saints Square, is shown looking towards the widened Bridgegate, which was still used by vehicles when this photograph was taken. It is now pedestrianised. 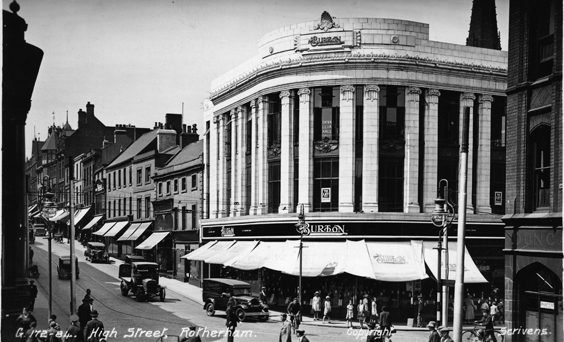 A view from Doncaster Gate onto High Street, showing Montague Burton’s men’s outfitters store at the bottom of High Street, which was built in 1931. 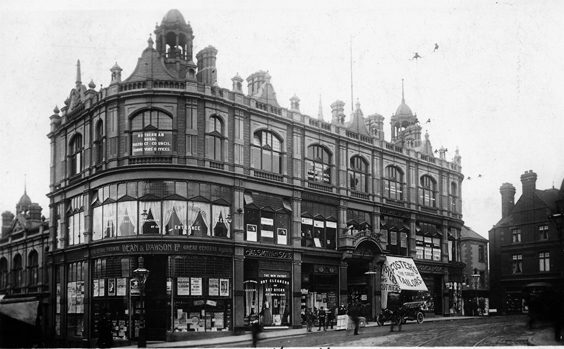 The Imperial Buildings replaced the Shambles in 1907. There were shops on the outside and inside (around a courtyard with a glazed roof). Above the shops were offices, which have now been converted into apartments. From the second half of the eighteenth century the town grew outwards in all directions as it played a leading role in the Industrial Revolution. This included not only industrial but also suburban expansion and the provision of public open space. Shown here is Masbrough Street, an important street in the industrial satellite of Masbrough, just across the River Don from the old town. Masbrough soon became an extension of the old town to the west of the river. A row of children in a variety of Edwardian attire line up, while, behind them, mothers hold up babies for the camera. At the corner shop the staff of R. Moses’ general dealers and tobacconist’s store also pose for the photographer. 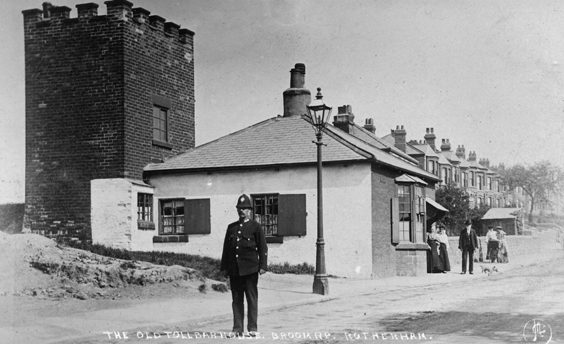 The toll house, with jutting-out windows on the roadside to keep an eye on approaching traffic, was built in 1826 on the Rotherham to Barnby Moor turnpike road. It was demolished in 1928. No one knows what the function of the square tower behind the toll house was. 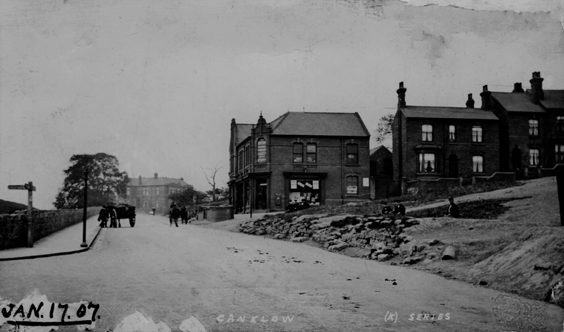 This early twentieth-century postcard is labelled ‘Canklow’, which on early OS maps covered an area on both the Whiston and Brinsworth sides of the River Rother near Rotherham Main Colliery. The street on the right is the bottom of Atlas Street, built by John Brown to accommodate Rotherham Main miners and their families. It was called Atlas Street after the name of John Brown’s steelworks. All the old houses, except for two, have now been replaced. 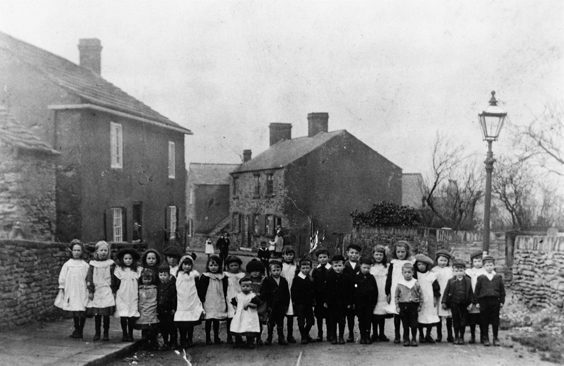 Smartly dressed village children line up for the photographer in Scholes in 1906. In 1891, out of a working population in the village of 102, no fewer than eighty-eight were coal miners. It is now called ‘Millionaire’s Row’ by some people! 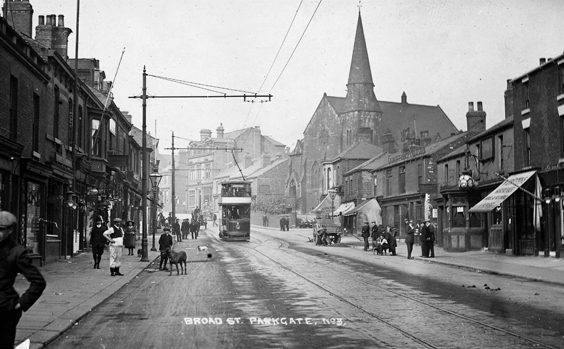 Parkgate grew up in the nineteenth century to the south of Rawmarsh as an industrial satellite. Its creation and subsequent growth was mostly the result of the opening of Park Gate Iron and Steel Works and Aldwarke Colliery. 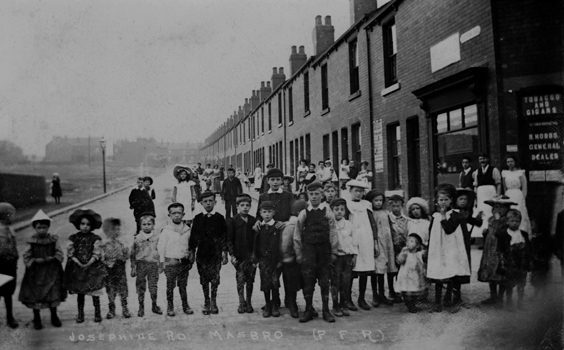 A street scene from around 100 years ago, with the usual gang of children in attendance. 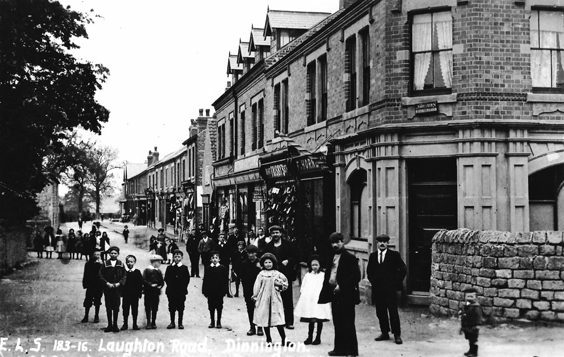 Laughton Road contained a wide range of shops at that time. In the foreground the barber’s pole of Fred Horne’s hairdresser’s shop can be seen. 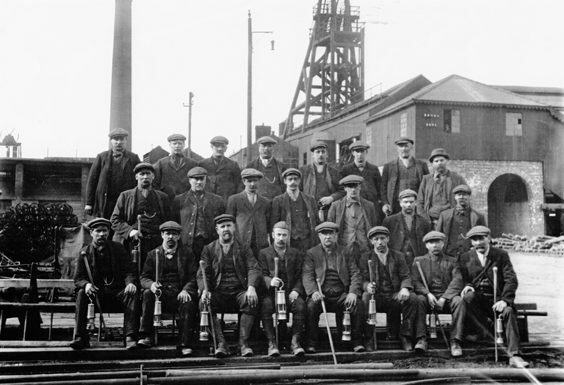 Whether working the land, mining coal, making iron and steel and other metal products, pottery and glass, the people of Rotherham have over the centuries became renowned for their industry, hard graft and inventiveness. And those engaged in farming or manufacturing were served by a legion of shopkeepers and itinerant tradespeople. 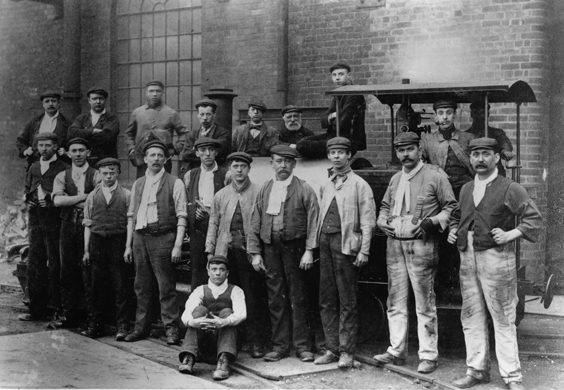 Pictured here in around 1910 are workers at Park Gate Iron and Steel Works where, in the 1850s, the armour plate for Isambard Kingdom Brunel’s steamship the Great Eastern was manufactured. Shown here is a group of pit ‘deputies’ (identified by their sticks) and other senior employees at Manvers Main Colliery, Wath upon Dearne. Manvers Main consisted of two collieries 650 yards apart, the first coal being raised in 1870. It was later linked underground with other local collieries. The colliery complex closed in 1988. 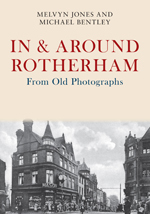 One Comment on "Rotherham and District – A History in Old Photos and Postcards"